Leak off test in drilling is conducted to measure the pressure at which the drilling fluid just start to leak into the formation or the formation just start to fracture.Alternatively leak-off pressure is the maximum pressure which the open hole section can bear without fracturing and from this maximum pressure we can calculate the maximum mud weight which could be used to drill this open hole section. Leak off test is conducted in the new formation after the casing has been set. All the above pressure tests have the same procedure and are conducted to measure the strength of the weakest part of the next hole section to be drilled. 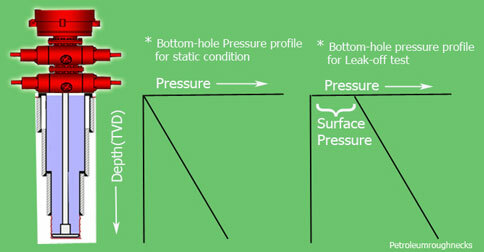 For these pressure tests it is assumed that the shallowest depth of the open hole section has the least strength because as we move deeper compaction increases (due to the weight of overlying formation) and so does the strength of the formation.if we make sure that during any operation(drilling, tripping and casing) in the open hole pressure does not exceed the leak-off pressure there will no chance of fracturing the open hole. After the casing and cementing , 3 to 5m of next hole section is drilled. Drill string is pulled into the casing shoe. Equal volumes of Drilling mud is pumped in intervals(Generally 1-2 bbl) from the cementing unit.After pumping each volume, pressure will increase as the well is closed. Surface pressure and cumulative volume is plotted on a graph. After the test is finished, pressure is bleed-off from the surface and the BOP is open. 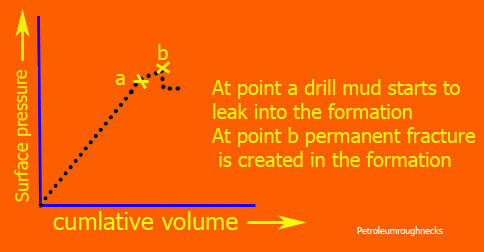 Initially the graph is straight line showing surface pressure is directly proportional to the cumulative volume being pumped.After point “a” graph deviates from straight line relationship but still the pressure will increase with volume.This deviation shows that drilling fluid has started to leak into the formation.At point “b” pressure decreases drastically which indicates formation has been fractured. For this example at 3600 psi formation below the casing shoe will start to fracture so we will plan further operations such that pressure at shoe never exceeds this value. From this Maximum allowable pressure, maximum mud weight which could used to drill the next section can be calculated. If Mud weight exceeds 13.84 ppg while drilling the next hole section, formation will fracture so mud weight should be less than 13.84 ppg.If for any reason mud weight has to be increased we will first case and cement the open hole than increase the mud weight. 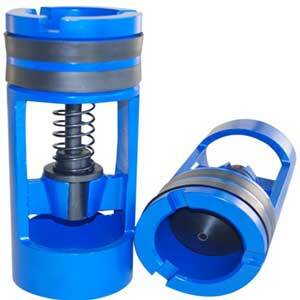 Note:- Generally Cement unit pumps are used for Leak-off test as they are more accurate than Rig pumps.